Screw-locking inserts provide an exclusive, resilient internal locking thread that grips the bolt and prevents it from loosening under vibration or impact. Locking action is achieved by one or more of the coils of the insert having a series of straight segments, or chords. 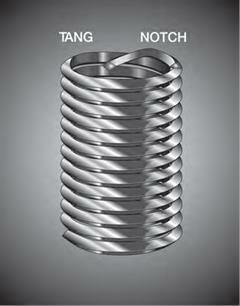 When the bolt enters this grip coil, these chordal segments flex outward creating pressure on the bolt. This pressure is exerted between the flanks of the bolt thread thus utilizing the maximum contact area and minimizing the unit pressure. Screw-lock inserts permit repeated assembly and disassembly yet will not relax their grip on the screw even in tough metals such as cast iron, alloy steel, titanium, etc.